If the do-nothing approach doesn’t give you a sense of outdoor peace, then by all means become a habitat farmer. Go ahead and engage your passions for sweating, getting your hands dirty, using manly tools, and being the lord of all you survey. Just follow the habitat farming tips below to reduce your lawn’s impact on the Bay. Surveys indicate less than ten percent of Bay residents get a soil test to determine the actual nutritional needs of their lawn. Folks that do get a test usually discover that they don’t need to apply as much fertilizer as they thought, or that other soil amendments (such as lime) will give them the greener lawn they desire. Most lawn care products application rates are based on a thousand square feet. Do you really know what size your yard really is? Take an afternoon to recline on your deck and visualize a thousand square feet (think of a square ten paces by ten paces). The most common reason why folks over-fertilize is that they over-estimate the size of their yard when buying lawn care products. A great way to save a lot of time is to try to shrink your yard by about five percent each year. Start with the soggy and/or steep areas that are hard to mow. There are many attractive ways to shrink a yard. 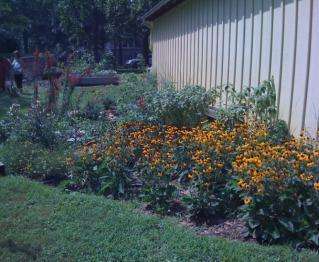 You can lay down three or four inches of mulch and plant some container grown plants. Or buy a meadow seed-mix for about ten bucks from your local lawn/garden store, which contains colorful annual and perennial seeds that can attract butterflies and hummingbirds to your home. Birds love to eat insects and grubs, so try attracting them by planting native trees or shrubs that produces tasty berries. Then, sit back on your deck and let the birds do the work. Big insect-eaters include bluebirds, cardinals, robins, nuthatches and tufted titmice. Women think men that use old-fashioned push-mowers, rakes, shovels and hoes are sexier, smell better and can actually hear what they are saying. I generally feel the same way about women who use hand tools, except for the talking part. For those of us that need to structure our otherwise miserable lives around our next big outdoor project, one can always rip up the entire lawn and incorporate compost into soil to turn it into a healthy grass sponge, or install a rain garden that treats roof runoff in a cool wet meadow. Check out the Baywide Design Specs on this website for soil compost amendments and micro-bioretention to get do-it-yourself guidance.